If you feel you’ve got rhythm in your bones and a beat in your head, the cymbals and skins might be for you, so put your sticks together with drum lessons in Doncaster and learn the liveliest instrument of them all. The drums are possibly the easiest instrument for young children to learn. After all, kids love bashing away at things! After a little while those things become a beat, and that beat makes a musician! If you’re an adult wanting to learn from scratch or further your skills, it’s never too late to start. 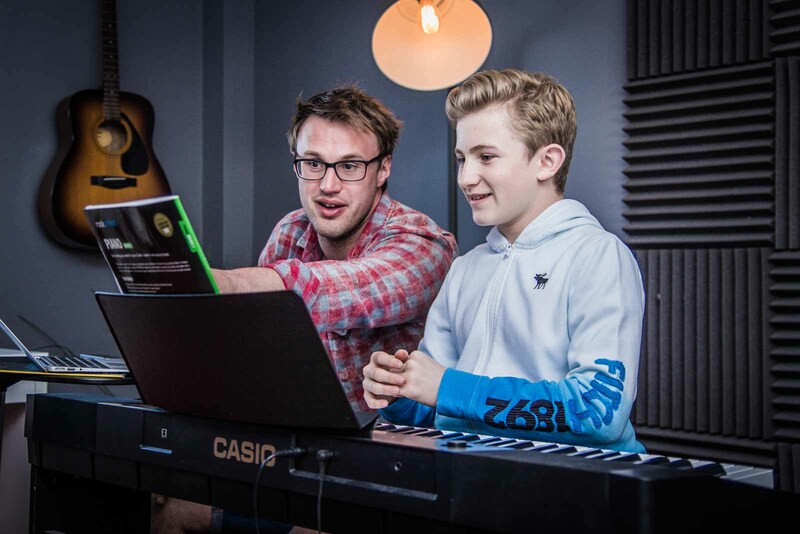 We teach ages 7+ and people of all levels of skill and experience are welcome to come for drum lessons in Doncaster – we can take you from the beginner level through to being an advanced player no matter how long you’ve been playing. What will I be taught in my drum lessons? We’ll start you off learning the basic movements and move you onto forming a beat. You can then progress onto more advanced techniques and learn the skills you’ve always wanted. Drums are BIG on technique. We’ll guide you on grip, stick height, rebound, control as well as various foot techniques. To some drummers, rudiments are everything. Nail those double stroke rolls, paradiddles and flam taps. A good base of theory makes learning songs by ear, improvising and writing a whiz. A lot of great rock drummers started out as jazz players. We’ll help you mix up your style to become a better all-round player. We’ll teach you methods such as the moeller, push/pull, slide and heel and toe to become a faster and more dynamic drummer. It might be easy to play a simple beat but it takes years to make that beat sound incredible. It’s all about the groove. It’s a fact that you’ll never see an empty kit at a band rehearsal – as soon as the drummer gets up someone else always jumps on it to lay down a beat – and you can never pull them away! The drums are the instrument everybody wants to play. We teach all styles of drumming, from rock to jazz, funk to metal – our tuition is tailored to you, so you’ll only learn what you want. Our facility is situated in the heart of Doncaster, just outside the town centre (find us on a map). If you’ve been searching for drum lessons in Doncaster you now have a safe and friendly place to visit and take tuition with experienced musicians. Want to learn in a group environment instead? We also be introducing drum lessons in a group environment soon as one of our unique Amped Up Programs – perfect for those who want to share their experience with like-minded musicians of a similar skill level.